Though I now feel myself in this position, I am infrequently at a loss for words. It’s not for lack of something to say. Rather, I’m somewhat overwhelmed with the number of things that traversed my mind while reading this very engaging tale of a group of women brought together by desire and need. I struggle with where to begin and decide to start with a concept. Life is like a multi-dimensional Venn diagram made with a spirograph, wherein every line crossing another represents a connection, and the empty spaces within those lines represent a relationship. As the number of lines increase, so do the number of overlapping spaces, and that’s where the magic happens. What’s in that space? What’s the story of the interstices of this three-dimensional space? Robertson reaches into an interstice to craft a heart-felt and sometimes raw, story of a moment in time. You will come to know some of the Lydia Roper Home Ladies. Robertson finds herself in a situation requiring recuperation at the Lydia H. Roper Home, and being cooped up doesn’t suit her. She needs a way to keep herself engaged, something for the mind and soul to focus on and nurture. Reaching into her experience as a teacher and her knowledge of the bible, she wonders if starting a bible study group may be part of her path to recovery. As the story unfolds, it occurs to me that Robertson is the seamstress who has placed out a basket for donated fabrics and the women who participate in the group are the fabrics placed in the basket. While weaving this quilt of relationships, she finds humor, sadness, friendship, frustration and insight, yet this isn’t enough. 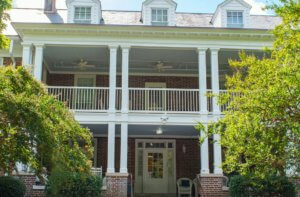 The Lydia H. Roper Home contains artifacts of the life of Lydia and her husband Captain John Roper, such as furniture and portraits. Unknowingly, a seed has been planted. For Robertson, Lydia is the last piece of her quilt. Who is this society matriarch who felt the need to establish a home for women? What was her life like? What is her story? 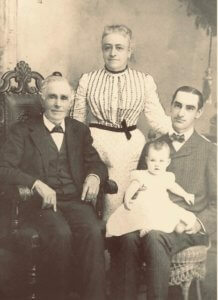 With the explosion of genealogy and online access, one expects to find information without much effort. However, Lydia is elusive, even to her own family. Ultimately, the reader will come to know these women, be brought into their inner circle, and struggle with Robertson to find Lydia. 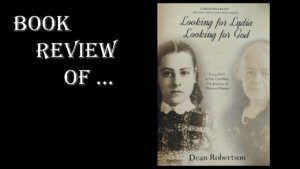 In Looking for Lydia; Looking for God, you will find a story worth telling and written well. It will engage you fully. Truth be told, thinking I might assist Robertson’s inquisitiveness I spent about forty minutes online searching for Lydia after finishing the book. It was late so I stopped. As I now sit here writing this review, I feel the pull of Lydia.